I finally saw my first migratory Eastern Phoebe of 2014 today at Rockaway Community Park in Queens! It is the next-to-latest date I have ever had my first of the year. For me, spring doesn’t really begin until I see my first phoebe on migration so I am relieved that I finally saw one. Spring can now start! 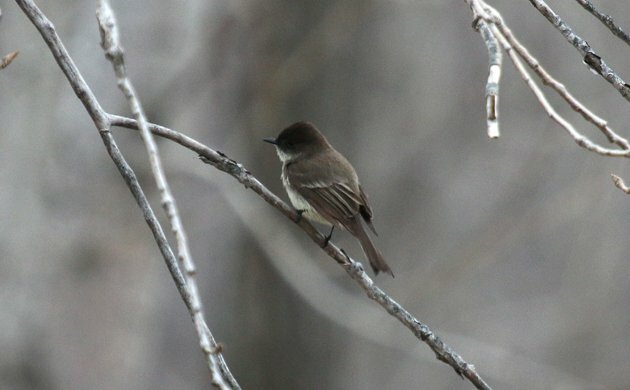 As I have for the last several years, I will now ask the same question of midwesterners and northeasterners that I ask every year: When did you see your first Eastern Phoebe of 2014? And was it late or early? The average date I see my first migratory Eastern Phoebe of the year is 20 March. What about you? By the way, the picture at the top of the post is the bird that was my first of the year this year. I thought that despite the relative lousiness of the photo that it deserved to be shown, just because it it showed itself to me. I meant to say I see them in the winter along the Texas gulf coast but not in abundance. I think they migrate further inland and do not stay year round. I saw one just a few weeks ago and earlier in the winter. They are cute little birds.